TGIF all & it's time for Yum yum for the tum tum! Get your salmon sashimi fix with Feast @ East Restaurant, Grand Mercure Roxy Hotel, this time with the local fare delights. In conjunction with Singapore's 49th birthday, Feast @ East Restaurant offers a selection of local cuisine till 31st August. The restaurant have five menu to rotate around and here is some of the favourites or dishes that left a stronger impression. It is my second time for its buffet so I try not to talk about the same things that I had already mention in the previous blog post for the restaurant. Read my previous entry HERE! p/s : Pardon me for the not-so-good pictures, I'm trying my best already! Black pepper crayfish & some chicken in thai sauce. 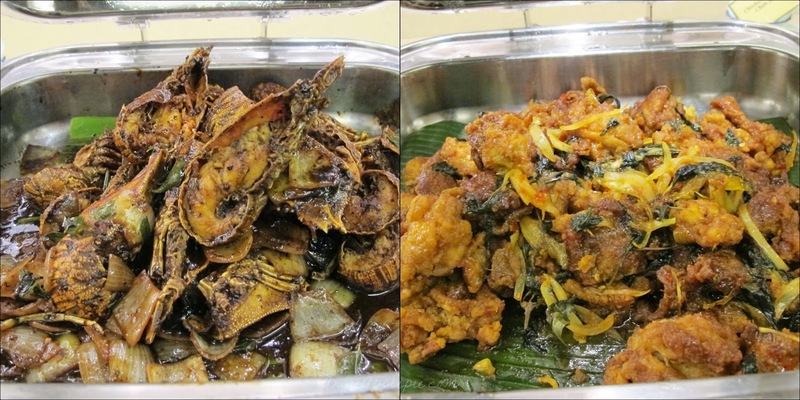 Dishes like Herbal boiled prawns, Braised pork trottles, broccoli with baby abalone were also in the menu. What else do you want ? ermmm. Kong Poh frog leg? steamed promfret fish ? ALSO HAVE. And I personally find it nostalgic, those were the dishes that we had during wedding dinners when we were young, isn't it. There's how the action station looks like ! It still serves the signature laksa, but what is different from my previous trip was the the other dishes were replaced by mee siam, beef noodles and roti prata ! There were also tu tu kueh station where you can choose either coconut or peanut fillings. It was my first time trying a tu-tu kueh. Yum! Moving on to the desserts station! "TODAY I WILL EAT THE DURIAN CAKE"
Not just the westernised cakes we see in all the hipster cafes and ridiculous expensive restaurants, look what is on the dessert trays - traditional kuehs and what? PANDAN CAKE. After all my dessert crave was 90% full, Gin & I found coconut ice cream! Totally the right way to end the dinner. Promotion til 31 Aug 14.